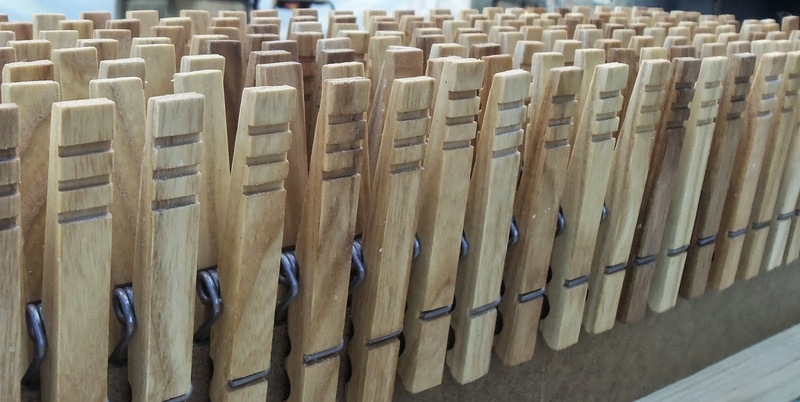 These oiled-and-waxed hardwood clothespins are air-curing. Boy Howdy! I sure am an optimist! A week ago I wrote that I hoped to have assemble-your-own, "Classic American" clothespin kits ready to sell on this day. Well, that aren't happenin'. Not yet. It turns out that bootstrapping an heirloom-quality hardwood clothespin company into existence (in a tent in my side yard) is taking longer than I anticipated. 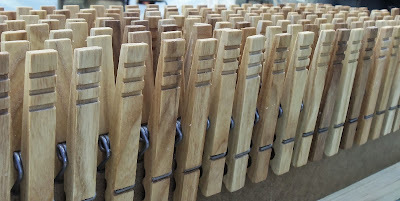 In addition to getting the kits ready, I'm working at milling out a second production run of clothespins. I'm doing it all myself now that my son is in school, and I want to get it done while the weather is still good. Cold autumn rains will be here soon, then snow. You know that old saying... Make your clothespins while the sun is shining. So I'm putting in a lot of hours, but I'm enjoying myself. I've been a woodworker for years. I love to work with my hands, and tools, and wood. Woodworking outdoors, under a tent, with the sides up on a sunny day, is much nicer than working in my crowded workshop. Keep an eye on the Classic American Clothespins web site. I'll be getting that together soon. I'll be posting prices there too. But the price for clothespin kits there will be more than the introductory price I'll be selling them for here at this blog. The introductory price per 20-clothespin kit will be $20 each. They will be on sale here for 5 days, or until they are all sold, whichever comes first. Then the kits will be available at the clothespin web site for the higher price. If you want advance notice of when I will be selling them here, be sure to sign up for the Planet Whizbang newsletter. I'll not be blogging regularly again until I get this clothespin business up and running. But I'll post a little weekly update (on Friday), like I'm doing now. 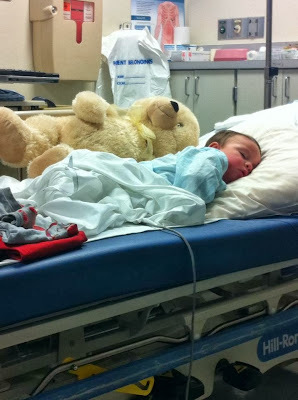 It's always sad to see a baby or young child in the hospital, but it's especially disconcerting when it's your own child, or grandchild, as was the case with my grandson, pictured above. Marlene and our daughter-in-law were shopping at WalMart when Futureman got sick and threw up. That's understandable. I was at WalMart a couple weeks ago and I felt like throwing up too (WalMart has that affect on me). But Futureman quickly developed a high fever and Marlene took him out of the store while his mother went to get some Tylenol. As Marlene was holding him he had a seizure. It's a freaky thing when a child has a seizure. Fortunatly, Marlene knew what was happening. The same thing happened many years ago with Futureman's father. It's called a febrile seizure. When a baby's temperature rises too high, his brain short-circuits. That's my non-technical explanation. Marlene took Futureman back inside the store (to a Subway restaurant) and asked them to call an ambulance, which they did. The 911 operator was asking all kinds of questions of the one employee who called and another woman employee said, "Just tell them to get an ambulance here quick!" Then she said, "I'll drive him to the hospital myself if they don't get here soon!" In other words, they really did a great job responding to the mini-crisis. The ambulance came and took Futureman and his mother to the hospital. Marlene caught a ride to the auto dealership down the road (where our car was being worked on), then headed to the hospital. Everyone was home a few hours later. Futureman looked tired but was in pretty good spirits. He's fine now. We took a hike down the creek behind our house yesterday. Futureman doesn't actually hike, but he likes to ride in a backpack carrier that Marlene bought at a yard sale. 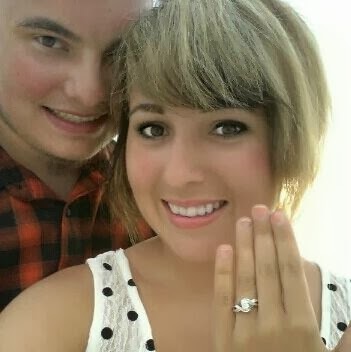 My #2 son (of three) has asked his girlfriend to marry him. The happy couple, pictured above, are planning a summer 2014 wedding. Last winter I paid to send my two youngest sons (with their girlfriends) to Financial Peace University. They really enjoyed the classes. Now my oldest son and his wife are going to FPU, and I'm downright pleased about it. Dave Ramsey is a great communicator and he has a lot of good financial wisdom. I think his Financial Peace University program should be taught in every public high school and to all US military recruits. But, alas, that will never happen. It will never happen because the teaching is overtly Christian. We can't have anything Christian in the government schools anymore, and, from what I hear, Christianity is becoming less tolerated in the military. The secularists are running the place now and they say it's an establishment of religion, to teach overtly Christian principles in government schools. But the man-centered religion of secular humanism is perfectly okay. Anyway, it has occurred to me that if a lot of Americans took Dave Ramsey's advice, if they bought only what they could afford, and didn't go into debt, the American economy, and the industrial era, would crash much more quickly than it is. Son #2 set up a game camera in the swamp out behind my parents place, which is 3 miles from here (he is buying the house and property from me). 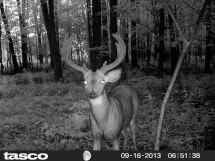 The land has a lot of deer on it, and the buck above is the one he wants this hunting season. The saying is not good thing come to impatient folks. =) I'm happy to wait. I know these are going to be great! Yeah, I'm also glad Futureman is ok, and congratulations to #2 son! Note to self: Read entire post before commenting! Same thing happened to my daughter years ago. Just 18 months old and got a fever real quick and started convulsing. We rushed her to the hospital where she spent a week in isolation. They could not determine what was wrong with her until she broke out in the measles. Thank God she got to come home with us and grow up to become a beautiful person, inside and out, and a wonderful mom. I hope I can still buy the clothespins fully constructed. Congratulations on #2 sons engagement. They are a handsome couple. So glad that your grandson was okay. How scary! I had those as a small child and I'm very glad that none of my children did. Congrats on your son's engagement! Thanks for the update and have fun clothespinning! Glad to hear your grandson is ok, Praise Marlene that she knew what to do. Congratulations #2 sons engagement. Congrats to the newly engaged couple! Thankful to hear your grandson is ok! daughter allergic to pertussis vaccine in DPT vaccination. had terrible fever after second injection. it gets worse with age and can kill you. pertussis is in all tetanus vaccines and you must get special pertussis-free vaccine from health department if you need tetanus shot. did futureman recently have vaccine before rip to walmart? keep ice in bags every time child receives vaccines in case of reaction. will save life long enough to get to hospital. watch through the night when vaccine is given! Thanks for the comments and well wishes. No, futureman did not get a vaccination shot. But at a recent Dr. appointment they wanted to give him shots. This vaccine thing with little kids is getting out of hand nowadays. Thanks for the information! I'm sorry about not having clothespins ready for your wife's birthday. I suggest a real nice card and dark chocolate. That's my standard birthday gift to my wife. As for the clothespins.... think Christmas. A week in isolation! I'm glad to know everything turned out well. Thankfully, we didn't have to deal with something like that. It looks like I may just sell the kits to start. Sorry. If they don't sell, I'll put them together myself and sell the finished pins, but it will be at a later date. I'm flying this little idea by the seat of my pants and it's kind of evolving as I go. I see a video of your chicken plucker was linked to at Instantapundit - a neocon website (it's suppose to be a blog but he just posts links and a few pithy comments) which I'm ashamed to say I periodically read. Anyhow - it has a huge following so I hope you see a bump in sales. Mr. Kimball, as a fellow agri-prenurist I would be interested in joining your clothespin movement, in addition to a woodshop in the barn I also have a small portable sawmill and lots of hardwood that needs thinning. So will you be franchising or do you have other plans on expanding the American made clothespin project? The clothespins would accent our harvest baskets and wooden toys that we currently sell her in northwest Connecticut. Did you try making the pins in maple or other hardwoods? I've made clothespins with maple, cherry, basswood, poplar, oak, chestnut, and ash. 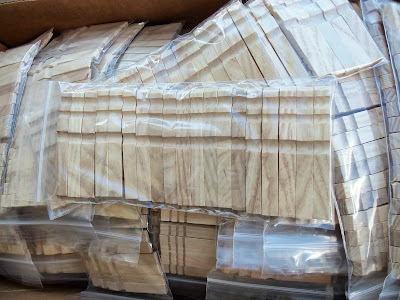 Hard maple is a good wood. My Classic American Clothespins web site will offer springs and specifications to woodworkers who want to craft their own clothespins as gifts, or to sell as part of a small business. No franchise, thanks. Just take the idea and run with it.